Yes. This is Content Marketing! SPOILER! Eye Catching headline that made me think it was a negative view on the Cobalt. And turns out, it was all about how the car found him his wife. I had a plan. I was going to get my degree and move to Michigan to start my career in the automotive industry. Then, after maybe five years with my career and condo resolved I would start to think about settling down with someone. It’s funny how life takes your perfectly laid out plans and shreds them to pieces. In the fall of 2009 I entered my senior year of college. Some of my good friends nearby had a new roommate who would rather study on a Friday night than explore all of the exciting options a Midwestern college town can offer (Bar A or Bar B). I didn’t pay much attention to her until I heard she was in need of a new vehicle. That’s when I threw out the standard “I can help you look at some new car if you want” line that gets politely turned down before the buyer goes and gets a turbo PT Cruiser with 200,000 miles. Being the de facto “car guy” in my friend circle leads me to being offered up as a consulting service whenever someone is in the market for a new vehicle. However, most people aren’t really looking for actual car suggestions and are rather looking to validate the car they already intend to purchase. That is why I was surprised by this girl I barely knew who actually accepted my car search services. I’m still not sure why she took me up on the offer, but I know now that life had begun its first tear into my exceptionally designed plan. The roommate and I ventured out to this small Chevrolet dealership in rural Minnesota for a deal on a blue 2005 Cobalt with low mileage. She liked the car, it was in good shape and I didn’t put much more effort into other options because it wasn’t like I was ever going to be stuck with this boring little econobox. On our drive back, we began to talk about all of those topics that you’re warned to never bring up to make a good first impression (religion, politics, casserole vs. hot dish). That led to many more conversations which led to a first date. Life had gone from tearing up my plans to setting them ablaze. She and I got engaged less than a year after getting the Cobalt and decided we wanted to take it on a road trip for our honeymoon. We drove a full oil change-worth out to this wonderful B&B in Cape Cod after a brief stop at Niagara Falls and the rolling Appalachians in upstate New York. We meandered our way down to get a true Philly cheesesteak from a (supposedly local) street stand in the city of Brotherly Love. 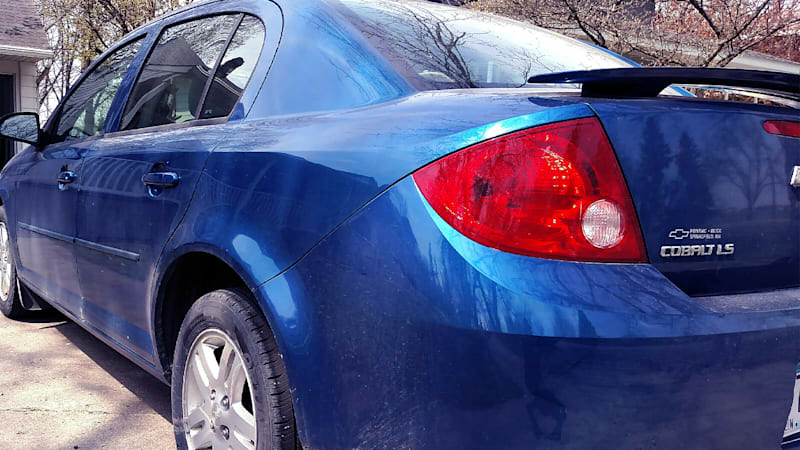 Then, we returned the Cobalt back to our new home in Wisconsin. None of this was part of my perfect plan that I had laid out for myself. The job was supposed to come before the girl. But, in reality, the car came first. This little blue Chevy ruined my plan, but our plan is much bigger than anything I could have ever created on my own.